BELOW market value!! $360 in service coupons on ALL Pre-Owned vehicles!! 27-time Precision Award winning Acura Dealership - MOST in the Country!!! Ask about the Mungenast Difference... 2017 Acura MDX 4D Sport Utility 3.5L SH-AWD w/Technology Package AWD Lunar Silver Metallic 9-Speed Automatic Acura CERTIFIED*7 YEAR/100K WARRANTY! !, CLEAN CARFAX ONE-OWNER!, Exclusively Serviced at Mungenast Acura, Factory Recommended Service Performed, Acura Technology Package with Navigation system, Heated Seats, Sunroof, Leather Seats, Bluetooth, Back up camera. 18/26 City/Highway MPG 3.5L V6 SOHC i-VTEC 24V Acura Certified Pre-Owned Details: * Limited Warranty: 12 Month/12,000 Mile (whichever comes first) after new car warranty expires or from certified purchase date * Transferable Warranty * Roadside Assistance * Warranty Deductible: $0 * Includes Trip Interruption and Concierge Services * Vehicle History * Powertrain Limited Warranty: 84 Month/100,000 Mile (whichever comes first) from original in-service date * 182 Point Inspection Please text, call or email our Internet Product Specialist: Jason Sherrill jasonsherrill@mungenast.com 314-856-5535. 2016 Acura MDX 4D Sport Utility 3.5L SH-AWD w/Technology Pkg AWD Crystal Black Pearl 9-Speed Automatic Acura CERTIFIED*7 YEAR/100K WARRANTY! !, CLEAN CARFAX ONE-OWNER!, Acura Technology Package with Navigation system, Heated Seats, Sunroof, Leather Seats, Bluetooth, Back up camera. 18/26 City/Highway MPG 3.5L V6 SOHC i-VTEC 24V Acura Certified Pre-Owned Details: * 182 Point Inspection * Includes Trip Interruption and Concierge Services * Vehicle History * Powertrain Limited Warranty: 84 Month/100,000 Mile (whichever comes first) from original in-service date * Transferable Warranty * Warranty Deductible: $0 * Limited Warranty: 12 Month/12,000 Mile (whichever comes first) after new car warranty expires or from certified purchase date * Roadside Assistance Please text, call or email our Internet Product Specialist: Jason Sherrill jasonsherrill@mungenast.com 314-856-5535. Budget Buy Opportunity!! All Budget buy vehicles are priced aggressive and represent great values...Budget buy vehicles pass Missouri State and Emission requirements. 2008 Honda CR-V 4D Sport Utility EX-L AWD Glacier Blue Metallic 5-Speed Automatic Heated Seats, Sunroof, Leather Seats. 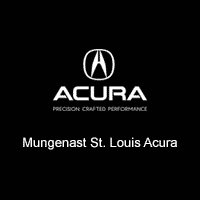 20/26 City/Highway MPG 2.4L I4 DOHC 16V i-VTEC Please text, call or email our Internet Product Specialist: Jason Sherrill jasonsherrill@mungenast.com 314-856-5535. BELOW market value!! $360 in service coupons on ALL Pre-Owned vehicles!! 27-time Precision Award winning Acura Dealership - MOST in the Country!!! Ask about the Mungenast Difference... 2016 Buick Regal 4D Sedan Premium II FWD Black Onyx 6-Speed Automatic CARFAX ONE-OWNER!, Navigation, Heated Seats, Sunroof, Leather Seats, Bluetooth, Back up camera. 21/30 City/Highway MPG 2.0L 4-Cylinder DGI DOHC VVT Turbocharged Please text, call or email our Internet Product Specialist: Jason Sherrill jasonsherrill@mungenast.com 314-856-5535. BELOW market value!! $360 in service coupons on ALL Pre-Owned vehicles!! 27-time Precision Award winning Acura Dealership - MOST in the Country!!! Ask about the Mungenast Difference... 2012 Honda Accord 4D Sedan SE 2.4 FWD White Orchid Pearl 5-Speed Automatic with Overdrive CLEAN CARFAX!, Heated Seats, Leather Seats. Odometer is 9055 miles below market average! 23/34 City/Highway MPG 2.4L I4 DOHC i-VTEC 16V Please text, call or email our Internet Product Specialist: Jason Sherrill jasonsherrill@mungenast.com 314-856-5535. 2018 Acura TLX 4D Sedan 3.5L V6 w/ASPEC FWD Modern Steel Metallic 9-Speed Automatic Acura CERTIFIED*7 YEAR/100K WARRANTY! !, CLEAN CARFAX ONE-OWNER!, Acura Technology Package with Navigation system, Heated Seats, Sunroof, Leather Seats, Cooled/Ventilated seats, Bluetooth, Back up camera, Local Trade, Apple CarPlayTM and AndroidTM Auto, Wheels: 19" x 8.0" Shark Gray Finish Alum Alloy. Odometer is 6705 miles below market average! 20/30 City/Highway MPG 3.5L V6 SOHC VTEC 24V Acura Certified Pre-Owned Details: * Warranty Deductible: $0 * Transferable Warranty * Limited Warranty: 12 Month/12,000 Mile (whichever comes first) after new car warranty expires or from certified purchase date * Powertrain Limited Warranty: 84 Month/100,000 Mile (whichever comes first) from original in-service date * Includes Trip Interruption and Concierge Services * Roadside Assistance * 182 Point Inspection * Vehicle History Please text, call or email our Internet Product Specialist: Jason Sherrill jasonsherrill@mungenast.com 314-856-5535. BELOW market value!! $360 in service coupons on ALL Pre-Owned vehicles!! 27-time Precision Award winning Acura Dealership - MOST in the Country!!! Ask about the Mungenast Difference... 2016 Acura MDX 4D Sport Utility 3.5L SH-AWD AWD Crystal Black Pearl 9-Speed Automatic Acura CERTIFIED*7 YEAR/100K WARRANTY! !, CLEAN CARFAX ONE-OWNER!, Exclusively Serviced at Mungenast Acura, Factory Recommended Service Performed, Heated Seats, Sunroof, Leather Seats, Bluetooth, Back up camera. 18/26 City/Highway MPG 3.5L V6 SOHC i-VTEC 24V Acura Certified Pre-Owned Details: * Roadside Assistance * Powertrain Limited Warranty: 84 Month/100,000 Mile (whichever comes first) from original in-service date * Includes Trip Interruption and Concierge Services * Limited Warranty: 12 Month/12,000 Mile (whichever comes first) after new car warranty expires or from certified purchase date * Warranty Deductible: $0 * Transferable Warranty * 182 Point Inspection * Vehicle History Please text, call or email our Internet Product Specialist: Jason Sherrill jasonsherrill@mungenast.com 314-856-5535. BELOW market value!! $360 in service coupons on ALL Pre-Owned vehicles!! 27-time Precision Award winning Acura Dealership - MOST in the Country!!! Ask about the Mungenast Difference... 2016 Acura MDX 4D Sport Utility 3.5L SH-AWD AWD Crystal Black Pearl 9-Speed Automatic Acura CERTIFIED*7 YEAR/100K WARRANTY! !, CLEAN CARFAX ONE-OWNER!, Exclusively Serviced at Mungenast Acura, Factory Recommended Service Performed, Heated Seats, Sunroof, Leather Seats, Bluetooth, Back up camera. 18/26 City/Highway MPG 3.5L V6 SOHC i-VTEC 24V Acura Certified Pre-Owned Details: * Vehicle History * Powertrain Limited Warranty: 84 Month/100,000 Mile (whichever comes first) from original in-service date * Roadside Assistance * Limited Warranty: 12 Month/12,000 Mile (whichever comes first) after new car warranty expires or from certified purchase date * Includes Trip Interruption and Concierge Services * 182 Point Inspection * Transferable Warranty * Warranty Deductible: $0 Please text, call or email our Internet Product Specialist: Jason Sherrill jasonsherrill@mungenast.com 314-856-5535. BELOW market value!! $360 in service coupons on ALL Pre-Owned vehicles!! 27-time Precision Award winning Acura Dealership - MOST in the Country!!! Ask about the Mungenast Difference... 2017 Acura MDX 4D Sport Utility 3.5L SH-AWD AWD White Diamond Pearl 9-Speed Automatic Acura CERTIFIED*7 YEAR/100K WARRANTY! !, CLEAN CARFAX ONE-OWNER!, Heated Seats, Sunroof, Leather Seats, Bluetooth, Back up camera, Local Trade. 18/26 City/Highway MPG 3.5L V6 SOHC i-VTEC 24V Acura Certified Pre-Owned Details: * Limited Warranty: 12 Month/12,000 Mile (whichever comes first) after new car warranty expires or from certified purchase date * Powertrain Limited Warranty: 84 Month/100,000 Mile (whichever comes first) from original in-service date * Warranty Deductible: $0 * Includes Trip Interruption and Concierge Services * Roadside Assistance * Transferable Warranty * 182 Point Inspection * Vehicle History Please text, call or email our Internet Product Specialist: Jason Sherrill jasonsherrill@mungenast.com 314-856-5535. BELOW market value!! $360 in service coupons on ALL Pre-Owned vehicles!! 27-time Precision Award winning Acura Dealership - MOST in the Country!!! Ask about the Mungenast Difference... 2015 Chevrolet Tahoe 4D Sport Utility LT 4WD Brownstone Metallic 6-Speed Automatic Electronic with Overdrive CARFAX ONE-OWNER!, Heated Seats, Leather Seats, Back up camera, Very Clean vehicle, Running Boards. EcoTec3 5.3L V8 Please text, call or email our Internet Product Specialist: Jason Sherrill jasonsherrill@mungenast.com 314-856-5535. 2018 Nissan Maxima 4D Sedan 3.5 SL FWD Brilliant Silver CVT CLEAN CARFAX ONE-OWNER!, Navigation, Heated Seats, Sunroof, Leather Seats, Cooled/Ventilated seats, Bluetooth, Back up camera. Odometer is 4181 miles below market average! 21/30 City/Highway MPG 3.5L V6 DOHC 24V Please text, call or email our Internet Product Specialist: Jason Sherrill jasonsherrill@mungenast.com 314-856-5535. BELOW market value!! $360 in service coupons on ALL Pre-Owned vehicles!! 27-time Precision Award winning Acura Dealership - MOST in the Country!!! Ask about the Mungenast Difference... 2013 GMC Terrain 4D Sport Utility SLT-2 FWD Ashen Gray Metallic 6-Speed Automatic CARFAX ONE-OWNER!, Heated Seats, Sunroof, Leather Seats, Bluetooth, Collision Alert, Lane Depart Warning. Odometer is 39404 miles below market average! 22/32 City/Highway MPG 2.4L 4-Cylinder SIDI DOHC VVT Please text, call or email our Internet Product Specialist: Jason Sherrill jasonsherrill@mungenast.com 314-856-5535. BELOW market value!! $360 in service coupons on ALL Pre-Owned vehicles!! 27-time Precision Award winning Acura Dealership - MOST in the Country!!! Ask about the Mungenast Difference... 2016 Toyota Highlander 4D Sport Utility XLE V6 AWD Ooh La La Rouge Mica 6-Speed Automatic Electronic with Overdrive CLEAN CARFAX ONE-OWNER!, Heated Seats, Sunroof, Leather Seats, Bluetooth. Odometer is 7814 miles below market average! 3.5L V6 DOHC Dual VVT-i 24V Please text, call or email our Internet Product Specialist: Jason Sherrill jasonsherrill@mungenast.com 314-856-5535. BELOW market value!! $360 in service coupons on ALL Pre-Owned vehicles!! 27-time Precision Award winning Acura Dealership - MOST in the Country!!! Ask about the Mungenast Difference... 2016 Acura TLX 4D Sedan 3.5L V6 SH-AWD w/Technology Package AWD Bellanova White Pearl 9-Speed Automatic Acura CERTIFIED*7 YEAR/100K WARRANTY! !, CLEAN CARFAX ONE-OWNER!, Exclusively Serviced at Mungenast Acura, Factory Recommended Service Performed, Acura Technology Package with Navigation system, Heated Seats, Sunroof, Bluetooth, Back up camera. Odometer is 4706 miles below market average! 21/31 City/Highway MPG 3.5L V6 SOHC VTEC 24V Acura Certified Pre-Owned Details: * 182 Point Inspection * Includes Trip Interruption and Concierge Services * Transferable Warranty * Vehicle History * Warranty Deductible: $0 * Roadside Assistance * Powertrain Limited Warranty: 84 Month/100,000 Mile (whichever comes first) from original in-service date * Limited Warranty: 12 Month/12,000 Mile (whichever comes first) after new car warranty expires or from certified purchase date Please text, call or email our Internet Product Specialist: Jason Sherrill jasonsherrill@mungenast.com 314-856-5535. BELOW market value!! $360 in service coupons on ALL Pre-Owned vehicles!! 27-time Precision Award winning Acura Dealership - MOST in the Country!!! Ask about the Mungenast Difference... 2016 Acura RDX 4D Sport Utility SH-AWD AWD 6-Speed Automatic Acura CERTIFIED*7 YEAR/100K WARRANTY! !, CLEAN CARFAX ONE-OWNER!, Factory Recommended Service Performed, Heated Seats, Sunroof, Bluetooth, Back up camera. Odometer is 10455 miles below market average! 19/28 City/Highway MPG 3.5L V6 SOHC i-VTEC 24V Please text, call or email our Internet Product Specialist: Jason Sherrill jasonsherrill@mungenast.com 314-856-5535. Budget Buy Opportunity!! All Budget buy vehicles are priced aggressive and represent great values...Budget buy vehicles pass Missouri State and Emission requirements. 2006 Toyota Sienna 4D Passenger Van CE FWD Silver Shadow Pearl 5-Speed Automatic with Overdrive 19/26 City/Highway MPG 3.3L V6 SMPI DOHC Please text, call or email our Internet Product Specialist: Jason Sherrill jasonsherrill@mungenast.com 314-856-5535.